The standard rules of common sense no longer apply once you enter the infinitely absurd domain of stock photography – especially when your distributor of choice is Shutterstock. As spotted by one snoopy Twitter user, the popular stock content provider now has a large collection of videos depicting a cryptocurrency trader impatiently monitoring a currency exchange chart in real-time… on his couch… in his underwear. But while all of his contributions are marked by the stereotypical stock photography banality and disillusionment, the cryptocurrency collection strikes me as highly unusual: I simply can’t imagine a situation where this footage can be used in a fitting manner. It’s simply too damn outlandish even for the bland world of stock photography. “A man in a T-shirt and shorts, sitting at home on the couch, monitors changes in the schedule on the currency exchange, looking at the computer monitor,” says the description accompanying one of these videos. In fact, Kopytin appears to have used the exact same description for every clip in this collection. 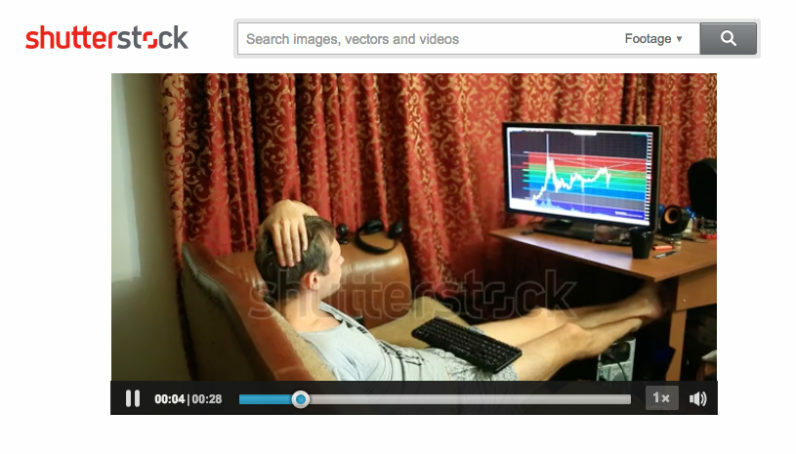 You can browse through the full collection by searching for ‘bitcoin trader’ on Shutterstock. Unfortunately, Shutterstock provides no information about how many times the videos have been purchased or downloaded, so there’s no telling whether people are actually using them. But as is often the case with these things: Poor stock photography makes for great memes – and this is the path we hope the ‘bitcoin trader’ collection is destined to follow.